Cookie offers perms for those that want a change in the wave or curl of their hair. Various size rods are used to control the curl and then a solution is applied to change the wave of the hair. Different solutions are used depending if the hair has been colored or permed before to insure that treatment is not damaged. You can create anything from volume to slight, medium or tight curls. These will last many weeks. 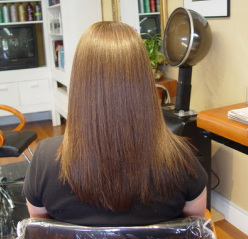 Permanent Straightening is also known as Magic Straight or Thermal Straightening. 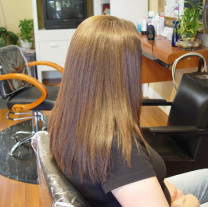 This is a permanent straightening process that comes to us from Asia. Your hair will be completely straight until it grows out. You’ll want to touch-up once your roots grow out about to about 3 to 4 inches. Be sure to treat it gently for the first few days. Cookie uses the i-Straight System. Cookie uses the i-Straight System that utilizes 3 solution strengths. The solutions can be inter-mixed to form a custom strength tailored to your hair type.